REAL Cooperative is partnering Big Tadoo Puppet Crew, Human Revolution, Are We Eating Fishy Food? and Eco-Womb to support the GMO Labeling Initiative in Oregon. Just before the ballots go out, we will tour around Oregon in the Fishy Fleet, using puppetry, theater, music and interactive art to get out the vote and encourage Oregonians to vote yes on Measure 92. 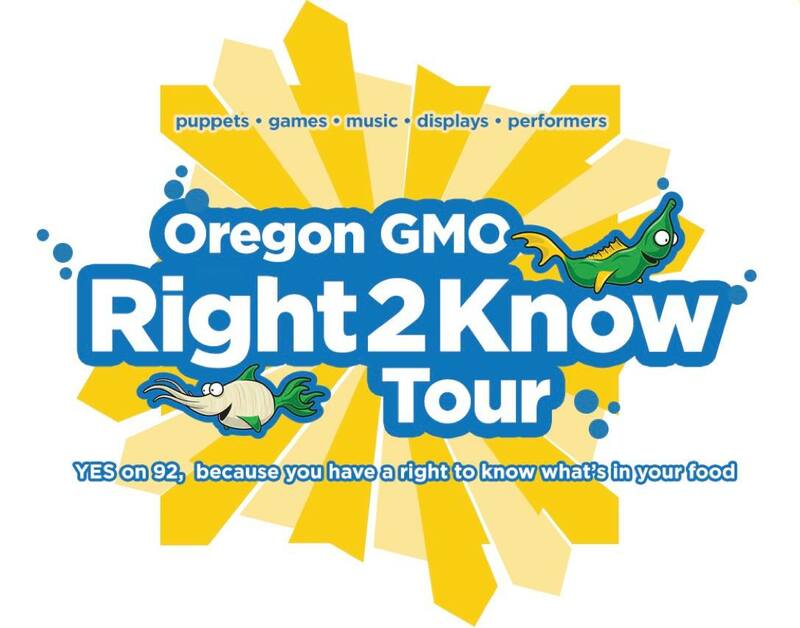 The Two Week Oregon GMO Right2Know Tour will take us thru Ashland, Medford, Eugene, Salem, Portland and Bend. We will have events at universities, farmers markets, flea markets, festivals, public events, theaters, as well as impromptu performances wherever there are spectators. You can find the full tour schedule HERE. The Events will include an educational info-booth, the GMO Freakshow from the Conscious Carnival and a small stage for performances by the Big Tadoo Puppet Crew and Human Revolution. The Big Tadoo will have a converted bread truck with a side that opens into a puppet stage for impromptu performances. The Big Tadoo will also create hand puppets of each of the fishy sculptures and will perform GMO songs written by the Big Tadoo. Human Revolution will headline each event with his conscious lyrics and and good ole fashion American Folk music. The Message is clear: Everyone has a right to know what they are eating! Especially when the food they are eating has been genetically altered by chemical companies that have lied about the safety of their products in the past. We live in a free market society that is based on consumer knowledge and without transparency we can not be truly free to make informed decisions. We have a right to know, label GMOs! ← Asheville ShareFest May 31st!